Kell would say it was impossible. What a useless word, in a world with magic. How is it that my heart flutters whenever I look at the cover of this book? Although a pretty slow paced sequel, A Gathering of Darkness takes its time to go more into the world that Victoria Schwab created so amazingly in A Darker Shade of Magic. Even if the sequel was slower, I think it’s important to point out that other things weren’t lacking such as: the character relationships and a bit more development of the characters and the world. 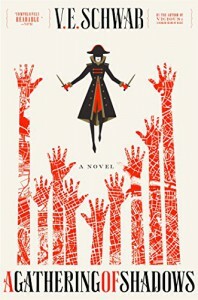 One of the best things that happened with this book compared to A Darker Shade of Magic, was that I appreciated other characters more instead of having a focus on Kell and Lila (although, they’re pretty amazing, too)! Damn it, a shout out to Alucard and Prince Rhy, please . Another thing I want to point out is that the romance was placed in the backseat for this one, which was nice. But it also showed that Victoria Schwab knows how to make you fangirl even though she showed the romance for, like, twenty pages out of this entire book! Even though the “antagonistic” story was pretty slow because it focused on the Games for this book, I think it’s safe to say that this book was more of a filler book but I am PUMPED for the NEXT BOOK WHICH ALREADY HAS A NAME AND COVER! God, I need to get my hands on, A Conjuring of Light which it says is coming out in 2017, so I am going to suffer for a while.